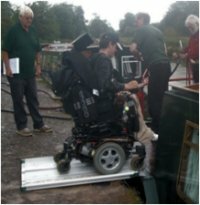 From January 2016 the Bruce Trust’s boats have been operated by the newly-formed “Bruce Branch” of the Kennet and Avon Canal Trust. The four boats are continuing to operate from Bedwyn with the Trust Engineer and all the administration is being undertaken by Kennet and Avon Canal Trust staff in Devizes. The Bruce Trust is continuing with its current board of Trustees and Rebecca Bruce remains as Director but its focus for the future will be more on fundraising and grant-giving for the specific benefit of its four very special boats. 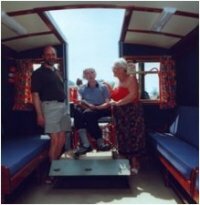 The Bruce Trust is a registered charity providing specially-designed, purpose-built, wide-beam canal boats, for hire for self-catering, self-steer holidays by disabled, disadvantaged or elderly people along with their family, friends or carers. All the boats have been designed to give wheelchair users the opportunity to steer by using the tiller. However, both Hannah and Rachel have been fitted with a remote steering device that enables someone with less upper body mobility to steer from their wheelchair, using a joystick. The boats operate from Great Bedwyn Wharf, near Marlborough, on the Kennet and Avon Canal, which flows through Berkshire and Wiltshire, from the River Thames at Reading to the River Avon at Bath. Two have a changeover day of Friday and two have a changeover day of Saturday. They are ideally situated to cruise towards Newbury and Reading or westward to Devizes and down the Caen Hill Flight and on to Bath. To find out how you can help us fundraise without it costing you a penny, visit our Fundraising page or contact Rebecca Bruce on: 07789 727493.